Sprinkled with dates, nuts, and cranberries, this Jeweled Rice Pilaf is flavourful on its own, while making a perfect base for curries and sides. Heat oil and butter in a rice pot then add the onions and sauté it until fragrant and translucent. Stir in the rice and lentils, followed by the carrot, cardamom, cumin, turmeric and salt. Add sufficient water to cover the rice and leave to cook. When rice is halfway done, pour the saffron with the water into the rice cooker and be mindful not to stir. 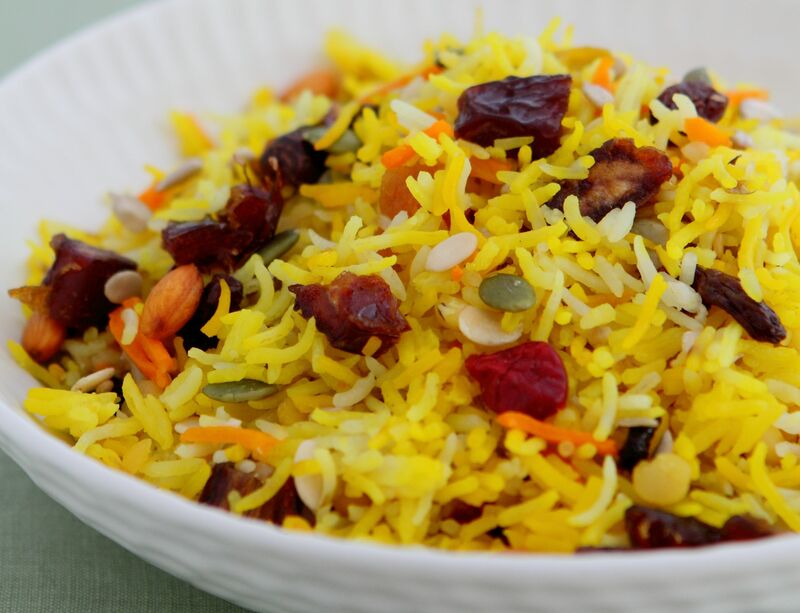 Once rice is cooked, stir in half the dates, nuts, raisins and berries, and scatter the rest over the rice when serving.